“to quell the rebellion in Poonch and Chibbhal territory "Gulab Singh returning from Peshawar and after some desultory warfare, the rebels were completely routed. Many of them were captured, and treated with vengeance; their hands and feet were severed by axes, while skins of Mali Sabaz Ali, two of the close accomplices of Shams-ud-Din, were peeled off their bodies, and their heads were hung on gallows in a crossing as a warning to others. Hands were ultimately laid on the chief rebel as well, and his head was cut off." He further mentions "Examples of severity were thought necessary but the cruelties perpetrated by Gulab Singh both in this and in the other campaigns in which he has commanded have caused his name to be generally decried and execrated." Gulab Singh as a treacherous and licentious person is further described as “the Panchas applauded the talks with the Jammu Raja, (Gulab Singh) which went on for about a week; and during this period the latter entertained the former with "abundance of food, sweetmeats, drinks and women". Gulab Singh sent Dewan Jawala Sahai to the British Camp “to represent that Jammu territory be granted as sustenance to his dependents.” The Dewan met Lawrence and Currie, who after discussing the whole matter with Hardinge, laid the condition that if the Maharajah paid the indemnity of one crore of rupees, the British would be willing to bestow on him the territories lying between the source of the Bias to the Sindh, including Kashmir and Hazara. Gulab Singh was, however, not in a position to pay such a heavy amount. He, therefore, suggested the exclusion from the grant the territory lying to the right band of the Bias and corresponding reduction in the amount demanded. This suggestion was accepted, rather welcomed by the British authorities. And in consideration of the exclusion of this territory, the amount of indemnity to be paid by Gulab Singh was reduced by twenty-five Lakhs. Talking about Muslim rulers, a special mention of Sultan Sikandar (1389-1413) is made, who banned gambling, drinking of wine, dancing of women and the practice of Sati among the Hindus. In matters of religion also, Shah Mir and most of the successors were perfectly tolerant, and made no distinction between their Hindu and Muslim subjects. Qutb-ud-Din 1373-89) even used to offer prayers at the Hindu temples. Maharaja Ranjit Singh succeeded his father at the young age of 12. Blind by one eye Ranjit Singh was born in 1780 in the Punjabi town of Gujranwala now in Pakistan. At the time much of Punjab was ruled by Sikhs as well as Afghans. Ranjit Singh was a Punjabi of the sovereign nation of Punjab. His samadhi is located in Lahore, Pakistan. He invaded and captured Jammu and Kashmir (1819). Sikhs have ruled Kashmir with an iron hand and stories of misrule, torture and humiliation of local population are numerous. In order to encircle and establish political hegemony, Ranjit Singh encircled the valley by allotting land to his army to rehabilitate to keep an eye on the local population on permanent basis. He did this by allotting land to his army and their families by selecting four corners, Shopian, Tral, Baramulla and Rangrett. Ranjit Singh died in 1839. The portrait of Gulab Singh in 1847, a year after signing the treaty of Amritsar, when he purchased territories of Kashmir for Rupees 75 lakhs(7.5 million Rupees) from British. Maharaja Gulab Singh born on October 18,1792, An illiterate to the end died at Srinagar on 30th June,1857. He signed and negotiated the TREATY OF AMRITSAR with British on 16th of March,1846. The treaty transferred the territories of Jammu, Kashmir, Gilgit and Hunza (excluding Lahul) to his independent possession. He is said to have played an eminent role in extending the boundaries of his kingdom. He faced a threat from Khalsa army of Punjab and turned to British for help and protection. As is said, the condition of the people of the state was deplorable and almost everything was taxed heavily. After paying their dues to the government, gratifying the illegal demands of the corrupt officials, the cultivators of the crop were hardly left with the third of their produce. Secondly, the security of life and property had disappeared. British Government received complaints against misrule of Gulab Singh which was termed as oppressive. 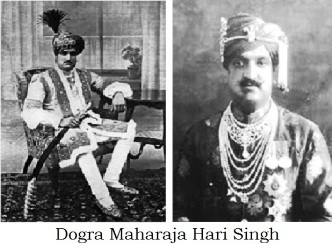 Successive governments of Ranbir Singh, Pratap Singh and even Hari Singh were no different as corruption was always at its peak and the Muslim majority community suffered at the hands of these dogra rulers who treated people like animals and would get a thrill by humiliating them which the rulers did on daily basis. To give an example, a Muslim would be sent to gallows for killing a cow compared to a hindu who would be accorded a minor sentence for a similar offence or for killing a Muslim. He abdicated in his sons favour on 20th February,1856. O! ye the morning breeze, if you pass via Geneva, word from us, The League of Nations, say repeatedly say, Peasant in the agricultural fields, Streams, Streets, Avenues! sold, a nation was sold and at what price! Maharaja Ranbir Singh succeeded his father on 20 February, 1856. He was educated privately, a great persian scholar and also knowledgeable of Sanskrit,English and Pushto. He died on 12th September,1885. All Dogra rulers have taken liberties with Kashmiri's Muslim majority population and apart from routine inhuman (begaar) conscription rules, Hari Singh,like his predecessors, would stick to the tradition of bullying, harrassing and humiliating the local Muslim population in order to rule over them with comfort. On August 12, however, he tried to enter into a "standstill agreement" with both India and Pakistan. While the former hesitated, the latter accepted this arrangement two days later. In the meantime, the actual partition of India took place on the night of August 14-15, 1947. All Dogra rulers have taken liberties with Kashmiri's Muslim majority population and apart from routine inhuman (begaar)conscription rules, Hari Singh,like his predecessors, would stick to the tradition of bullying, harrassing and humiliating the local Muslim population in order to rule over them with comfort. Succeeded his uncle Maharaja Pratap Singh, and ascended the throne on October 14, 1925. He maneuvered to maintain his independence by playing India and Pakistan with each other by signing stand still agreement with both the countries. He was forced by India to Sign the doubtful instrument of accession on 26th Oct,1947. In 1951 Hari Singh's rule was terminated by Government of India and lived in exile for rest of his life.He died in Bombay on 26th,April,1961. He was succeeded by his only son heir apparent with the title of Yuvraj Karan Singhji Bahadur. In order to create a fear psychosis and terror, Hari Singh followed the tradition of humiliating people as a routine matter and his tactics was slightly different from his ancestors. He would, very frequently, order his infantry battallion, known as Risaldar mounted on horsebacks to march through the main business hub Maharaj Ganj in downtown Srinagar and pick and choose a few healthy Kashmiri Muslim shop keepers to receive a number of lashes for no fault or crime, depending on the forbearance of a particular person. This kind of treatment had made Kashmiris timid, cowards and tolerant to face hardships. Yuvraj Karan Singhji Bahadur born at Cannes, France on March 9, 1931 succeeded his father Maharaja Hari Singh on 11th May,1931 and was appointed Yuvraj. He was appointed by Government of India as the Sadri-Riyasat on November 1, 1956 and lasted as sadre Riyasat till 1965. He was later appointed as Governor of J&K till March 15,1967. Thereafter he joined politics and became a cabinet minister in Government of India. "The condition of the people of the state at the advent of Dogra rule was deplorable. In Kashmir, for instance, almost everything was taxed heavily. After paying their dues to the government, gratifying the illegal demands of the corrupt officials, the cultivators were hardly left with a third of their produce. Security of life and property had disappeared. The Sikhs governors had been very lavish in granting jagirs so that there were as many 3,115 of these when Gulab Singh took over Kashmir." And while defending the first Dogra ruler, his ancestor, he continues: "Despite these measures, the British authorities in India received some complaints against Gulab Singh’s government, which was termed as oppressive. Though some of the British officers had earlier paid short visits to Kashmir and submitted their reports, the British authorities contemplated sending one of their officers to stay at Srinagar for three to four months in order to make detailed inquiries about the condition of its people. Subsequently, on finding that the complaints were exaggerated and made mostly by disgruntled elements,the proposed measure was dropped." "Gulab Singh died in Srinagar in 1857 and was succeeded by his only surviving son, Ranbir Singh. The new Maharaja was popular with his people but he was handicapped due to the lack of honest and capable officials. Despite this the state made some progress during his reign." While highlighting the achievements of his father, he points out various outstanding feats performed which, according to him, were unheard during earlier Dogra rulers. "In 1877 the state government carried out the first land settlement. As a result, the rights of the agriculturists were clearly defined and the states demand was fixed for ten years. "Begar or forced labour" in its most objectionable form was abolished. By 1912 practically every tehsil and district was settled either for the first time or in revision. The share of the state was fixed at 30 per cent of the gross produce and the revenue was to be collected in cash. The land settlement gave much-needed security to the cultivators and became responsible for their increasing prosperity. The revenue of the state also increased by more than 100 per cent". "Special stress was laid on the measures to protect agriculturists. Thus under the Agriculturist’s Relief Act, a debtor could bring his creditors to a court of law for the settlement of accounts. This freed the peasants from the rapacity of the moneylenders. The Land Alienation Act forbade the transfer of agricultural land to the non-agriculturists. If they wished improvements on their lands, they could easily get loans from the government on easy installment basis." While making special reference to Hindu population of Jammu province he mentions that"female infanticide, child marriage, traffic in women, untouchability and other social evils were common among the people of the state. Steps were taken to control these evils. Simultaneously he took up the matter of child marriage and promulgated an ordinance in which the age of marriage of boys and girls was raised to 18 and 14 respectively, and its violation was punishable by one year’s imprisonment or fine up to rupees one thousand or both. Maharaja Hari Singh threw open all public schools, colleges and wells to the untouchables in 1931. The next year all state temples were also thrown open to them. In 1940, he proclaimed untouchability a cognizable offence." This all is with reference to Hindu dominated Jammu province. "A commission was appointed to inquire into the grievances of the Muslims and other communities. Chief recommendations of the commission included a fair and adequate representation in the services to all the communities, grant of freedom of press and platform, return of the confiscated religious sites and establishment of a representative Assembly. The government accepted the recommendations and accordingly new rules for recruitment to state services were framed. As a result of this there was gradual expansion in the representation of Muslims in the civil services." The Maharani, fourth wife of Hari Singh, will go down in the history of Kashmir as being instrumental for changing the demographic character of Jammu province. As is said, when dogra forces suffered heavy casualties fighting infiltrators from North West Frontier areas, Maharaja alongwith his Maharani fled from the valley with all his possessions and reached Jammu. Upon reaching the main bazar in Jammu, wailing Maharani demonstrated to the people on the streets that they had escaped murder, mayhem and humiliation at the hands of Muslims in Kashmir. This sparked off anti-Muslim feelings and people joined by Maharaja's army went on a murder hunt and a massacre started killing Muslims whereever they could find them. The majority population of Muslims was converted into minority reducing the percentage to just 6% and a few lucky ones fled to the areas of Muslim dominated areas, now in Azad Kashmir. In spite of all this Kashmir valley remained peaceful and there was not even a single case of a backlash. In this connection Alastair Lamb in his A BIRTH OF A TRAGEDY writes: "In Jammu Maharaj (Hari Singh) was engaged in a series of massacres of Muslims which some observers have considered to have been the nastiest of all in that wave of attrocities which followed immediately upon the transfer of power: conservative estimates suggest over 200,000 deaths here between August and December 1947." An interesting story to remember is when Maharaja Hari Singh fled Srinagar he was followed by a group of Hindus who came down to Srinagar from different areas and hired Muslim TONGAWALAS to carry them to Jammu along with their possessions. Tongawalas obliged and carried them to Jammu and upon reaching their destination, these Tongawalas were butchered one by one for the services rendered. Muslims of Kashmir were paid measure by measure for maintaining human-rights, secularism and good human relations. The sadists were not satisfied even after butchering two hundred thousand Muslims of Jammu and adjacent areas. Sadri-Riyasat (President) Karan Singh administers the oath of office to Bakshi Ghulam Mohammad soon after toppling legitimate Government of Sheikh Abdullah on 9th August, 1953. Nehru's agenda fulfilled, removing stubborn Hari Singh from the political scene and Indian army firmly in control, made Sheikh Abdullah dispensable. Dogra conscription rules strictly adhered to by Maharaja's Risaldars (infantry men) to get maximum output from men and women alike. After finishing with men in the background, the officer, rod in his hand (an instrument for punishment), is approaching towards women. Mountbattens enjoying a ride in Maharaja's boat but on the pretext of illness due to a stomach bug, Maharaja avoided to see him, Pamela Hicks termed it as ´diplomatic illness´. Facsimile of purport Instrument of Accession between Maharaja Hari Singh and Mountbatten of Burma. Indian claims have never been proved and has always remained a question mark. 1. I hereby declare that I accede to the Dominion of India with the intent that the Governor-General of India, the Dominion Legislature, the Federal Court and any other Dominion authority established for the purposes of the Dominion shall, by virtue of this my Instrument of Accession but subject always to the terms thereof, and for the purposes only of the Dominion, exercise in relation to the State of Jammu and Kashmir (hereinafter referred to as "this State") such functions as may be vested in them by or under the Government of India Act, 1935, as in force in the Dominion of India, on the 15th Day of August 1947, (which Act as so in force is hereafter referred to as "the Act").